It has been and still is the policy of the Archdiocese of Los Angeles and of St. John’s Seminary that no student should be discouraged in pursuing his vocation to the priesthood because of an inability to pay for his education. But this is not to say that the seminarian should not do all that he can to meet the tuition, which is much lower than the actual cost of his education. *Seminarians are encouraged to seek financial assistance towards the cost of their training through private grants or donations from Church organizations. 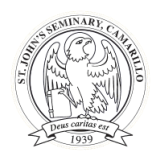 A financial plan for Los Angeles students at St. John’s Seminary went into effect on July 1, 1988. The details of this plan are available from the Business Office. Financial policy for payment of tuition, fees, and medical insurance is to be determined by the respective Ordinary, (i.e. bishop or religious superior). to assist seminarians who are in financial need. Specific requirements establish eligibility under each program. Students who are in need of financial assistance are to bring their requests to the attention of the appropriate personnel through the Director of Students and the Seminary Director of Finance.